Hainan consist of large island (Hainan Island) and 200 very small islands in the South China Sea near Hong Kong and Guangzhou. Hainan Island is the largest island in China with 35.000 square kilometers. Population is about 8 million people. Since 1988 it became a province of China. Agricultur and tourism are the main resources. Capital of Hainan is Haikou City. Most tourists on Hainan stay in beach resort Sanya. Taxi drivers often don't want to use their meters but ask high prices to bring you to the hotel. If you don't want the hassle, take the airport (public) bus. 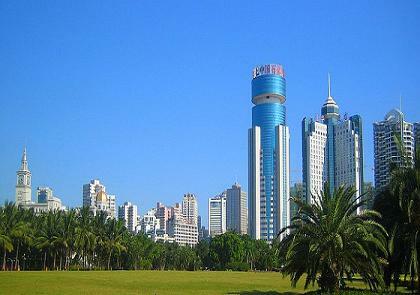 Sanya is the second city on Hainan Island with a population of 500.000 people. The white-sand beaches make it a popular tourism destination. Many Russian tourists come to Sanya. - Yalong Bay: 7.5 km crescent-shaped bay of white sandy beaches and crystal blue waters. Considered as best beach area. Distance to Sanya is 28km.